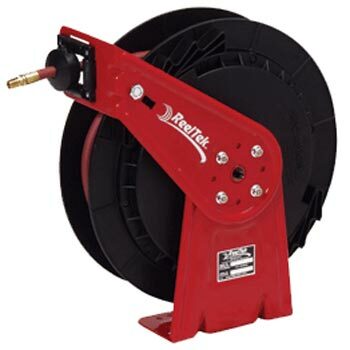 The RT650-OLP is a Shop Hose Reel we highly recommend for general garage use. This is our economy Reelcraft model with a lighter design than the heavier 5650OLP Hose Reel. The Reelcraft RT Series of Hose Reels are a new, lighter spring-driven hose reel designed for applications that are less demanding, yet require a product that can withstand industrial use. Kinkless Hose: High Quality, industrial grade kinkless hose is specially blended for use on reels. Easy to Mount: The base has two slotted holes for easy mounting and adjustment. Hose Retracts Every Time: The latch mechanism is mounted on the arm to insure hose extends and retracts every time. Easy Maintenance: The glass filled composite spool and spring case contains the industrial grade drive spring. The spring is protected from the environment for a longer life. Versatile Mounting: The guide arm can be adjusted to any of seven convenient locations.